This is great. Performed by someone who really knows the biology and chemistry of beer. Great musician as well! Cheers to you and yours this St. Patrick's Day! though, and I have since learned better technique. 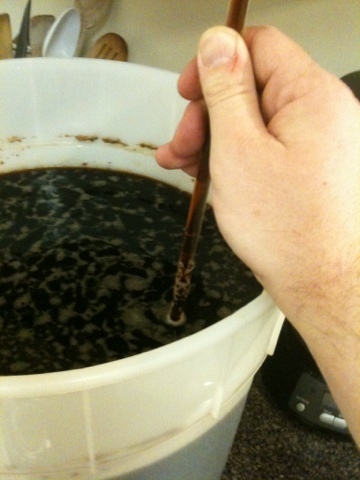 on Flickr”> The homebrew club I run has been asked to make a special beer for a pirate-themed party at Kena Shriners. One of the brews that the party organizers liked a lot was Andy's Christmas ale he made for his wonderful wife this past winter. It is malty and spicy, like a holiday pie mixed with dark beer. The beer we are making is a modification of Andy's brew, with slightly different ingredients, partly because I could not find everything on the list. Crystallized ginger, for example, was elusive, so I bought something I have read is the same thing: candied ginger. In addition, the original recipe called for organic chocolate malt but all I could find locally was regular, so I got that. I had another sticking point. The homebrew shop I go to was out of oatmeal, so I asked the question probably everyone wonders: can regular oatmeal be substituted for brewer's oatmeal? The lad at the store said yes, but make sure they are quick oats. Fair enough. That's something I will use anyway, so the remainder of the oatmeal in the canister can be put to good use. In addition, I will save the spent grain and do something cool with it. I foresee a high-fiber bread in my future! I just hosted a brew day for the homebrew club this past Sunday and we started the process. The spices smelled great and even Beautiful Girlfriend, not always a fan of homebrew smells, thought the scent was nice. She's a keeper! I can't wait to try the final product at the Pirate's Ball in May! Steep honey and additional spices for 45 min. Steep specialty grains at 150 degrees for 20 min. Mix together and add extract. Add hops at the right times. Cool it to 70-75 degrees by your preferred method. Bada-bing, bada-boom, it's ready to ferment. Get those yeast buggers in there! Ferment 2 weeks in the primary, transfer to the secondary fermenter for a couple weeks until there is a good layer of sediment at the bottom of the carboy, and then rack it into your bottles or keg. If bottling, use five ounces of priming sugar to get a good amount of bubbles. Dark Beer by Bernt Rostad. This is the reason Im going to the Pirates Ball….cant wait to try it. I have my first home brew batch ever fermenting in my 'complimentary' Mr. Beer keg….I already know the biggest problem associated with homebrewing…..the wait. but i look forward to upgrading my home brew kit (already have my tax return spent in my head) and I plan on passing the Mr. Beer kit to the next member of the group who wants to take the plunge. keep up the good work. Ian, I feel like a successful evangelist now. Definitely get the bigger brew kit before you get hitched. That way she is marrying into it! Hi. This recipe sounds really good for the winter. But for how many gallons /liter is this recipe. Hi Roald. It is a good warming brew. This recipe makes five gallons. The Amber and Dark Malt are LME right ? Im trying to convert this extract brew to a all grain version. Any pointers ? Brewed this one a couple months ago. Probably the best brew I’ve made yet. I even used the quick oats and yes, it gave a creamy mouthfeel. This recipe was a huge hit at work and with the relatives. Thanks to you, I’m a rock star! Thanks for sharing this recipe – I can’t wait to try it! On question: for the first step of steeping raw honey and specialty grains, is this done at room temperature or after warming to 150 degrees Fahrenheit?